During the first half of the 1970s, the late Professor Dr. E.W. 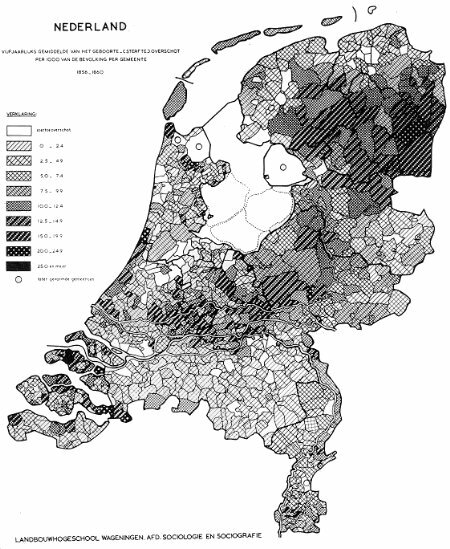 Hofstee collected demographic data on Dutch municipalities covering the period 1811 to 1850. Although these data are only part of a much larger demographic database, this material deserves particular attention as it concerns data that are not or barely available in the usual statistical publications. In his original analyses of these historical municipal data, Hofstee used geographical maps where each municipality was shaded according to its score on the variable in question. An important tool in constructing these maps was the so-called "Kartofoot": a large jigsaw puzzle of the Netherlands, where the pieces consisted of the separate municipalities. For each municipality, ten pieces were available, each with a different shading pattern. When the jigsaw puzzle was completed, it was photographed. In this manner, Hofstee constructed his demographic maps in the pre-computer era. With Hofstee's dataset as a start, NIDI has constructed a continuous database with annual demographic figures on births, marriages, deaths, and population size, by municipality. The complete database covers the period from 1811 up to the mid-1990s. The data are available in MicroSoft Access format (for non-profit scientific research only). For further information, please contact Erik Beekink. Demografische databank Nederlandse gemeenten, 1811-1850, NIDI report nr. 40. Den Haag: NIDI. 207 p.